A simple recipe for savory, flavorful, low-fat turkey burgers that’ll impress your cookout guests! You’ll never be satisfied with plain ole burgers again! We’re having unusually fantastic March weather in the northeast this year, which brings with it the desire to grill out, at least in our house. Kevin was home from work on spring break last week and we awoke one morning to warm temperatures and sunshine, so I headed off to the store to buy all the ingredients we needed to make Kevin’s famous grilled turkey ranch burgers. He’s developed his own recipe over the years, perfecting the most mouth watering burger you’ve ever tasted! Ready for the recipe? If you’re lucky, your’s will be a warm weather delight also! Once you try these savory and flavorful burgers, you’ll never again be satisfied with plain ole hamburgers! First, fire up your charcoal grill (takes 20 minutes to get hot enough). Finely chop the green onions, onion and pepper (or throw them in the food processor). Throw the veggies into a large bowl with the meat, and add all your spices, including the ranch mix. With your fingers, mash all the ingredients together until it’s well mixed. Form into burger patties and grill for 10 minutes. First, fire up your charcoal grill (takes 20 minutes to get hot enough). Finely chop the green onions, onion and pepper (or throw them in the food processor). Kevin says this is the most important step because you want them to blend right in with the meat. Throw the veggies into a large bowl with the meat, and add all your spices, including the ranch mix. You really can’t go wrong with the spices – in our house, more is better! Kevin takes each one and shakes it around the bowl about 6 or so times, which is probably a couple of teaspoons, if you want a measurement. Now it’s time to get your hands dirty! With your fingers, mash all the ingredients together until it’s well mixed. Mash it like you would bread dough! Now, they’re ready to grill! Kevin swears by charcoal flavor and doesn’t like gas grills. 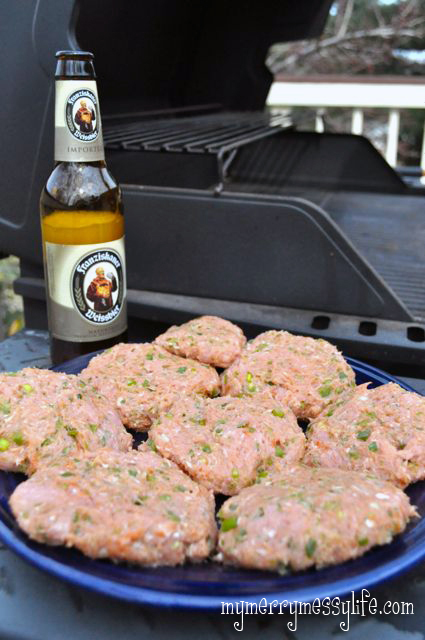 Grab your favorite beer (our’s is Franziskaner Weissbier), and get grillin’. 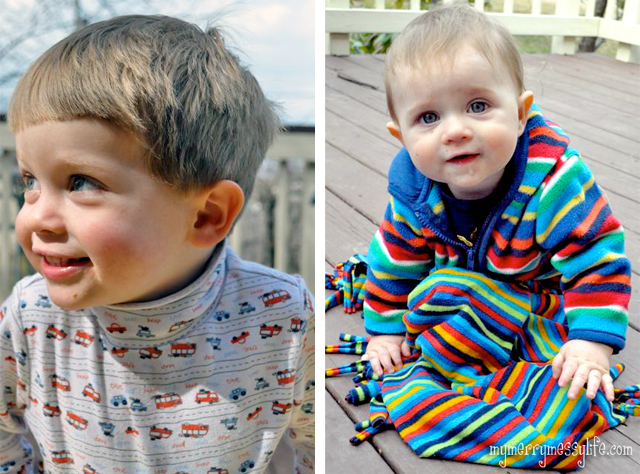 The kids love being outside with us while we grill! Mmm, mmm! Serve up with your favorite kettle-cooked chips (ooo, so bad! ), fluffy potato rolls, and enjoy with sunshine and family. Doesn’t get much better than that, folks.